The beating heart of Thor: Ragnarok is its humorous tone, and director Taika Waititi (What We Do In The Shadows, Hunt for the Wilderpeople) has impeccable comedic chops. Taika makes the most of the movie’s irreverent tone by parodying previous Marvel films, writing clever sequences, and dozens of additional Easter-eggs are undoubtedly stuffed in the film. Jokes and humorous moments never stop, and action scenes are peppered nicely throughout the film. The movie’s action sequences never feel gratuitous or self-indulgent despite liberal CGI usage. The film is essentially an 80s adventure film with a budget of almost $200 million dollars. The film’s synth soundtrack, its visuals and effects, especially on the ‘junk planet’ of Sakaar, blur the line between homage and parody. The plot of the Thor: Ragnarok is there just to keep the film moving, but thankfully makes sense and is paced well. Thor attempts to save Asgard from his sister Hela, the Goddess of Death, and from the impending doom of Ragnarok, but first has to escape from the savage planet of Sakaar. The film wouldn’t work if the actors didn’t have great comedic timing as well, and thankfully they do. Chris Hemsworth returns as Thor and anchors dizzying cosmic comedy. Hemsworth has always had good comedic timing and is unleashed to the fullest here. Hemsworth’s chemistry with Mark Ruffalo's Dr. Banner/Hulk is downright hilarious, but all of the cast’s interactions are great. 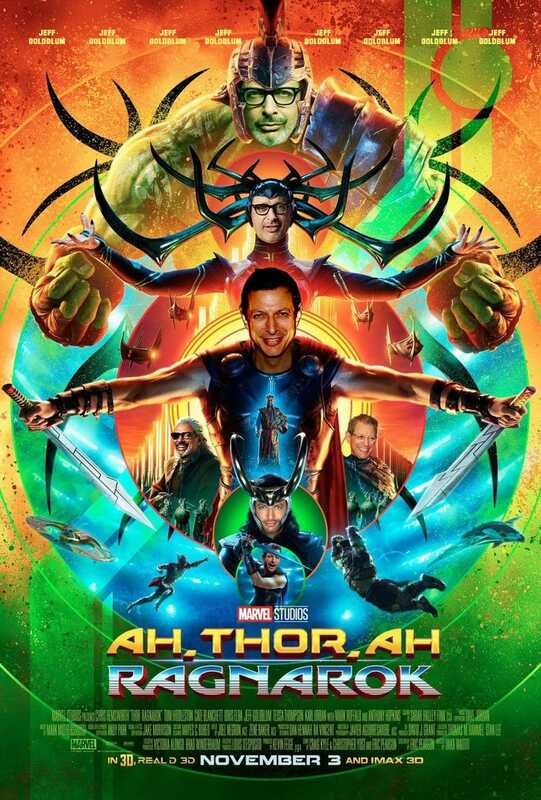 Not to be outdone, Jeff Goldblum shows up as Thor’s secondary antagonist, The Grandmaster, a sadistic and hedonistic ruler of the junk planet of Sakaar who pits unwilling warriors against each other in gladiatorial matches for his amusement. The Grandmaster is essentially everything the internet loves about Jeff Goldblum. Goldblum is ridiculous, pompous, flamboyant, and wonderful-its great. Taika himself even plays a purely comic relief character in Korg and he is the funniest character in a film stuffed with them. Cate Blanchett is absolutely wonderful in this film as the Goddess of Death, Hela, and I wished she had gotten more screen time. 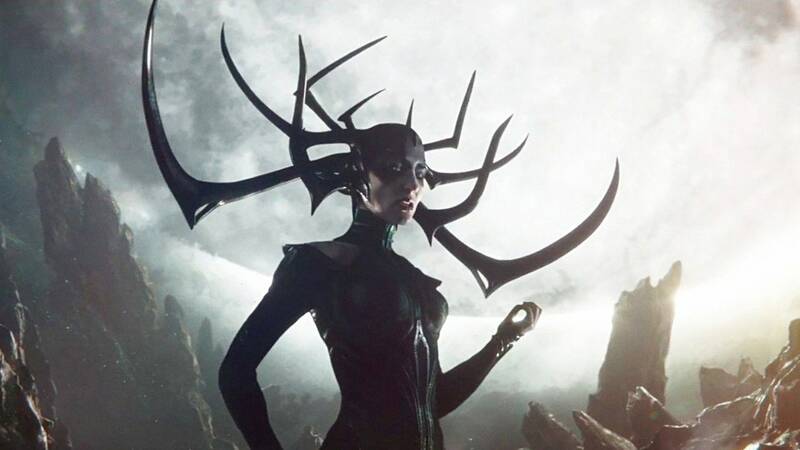 Her performance is larger than life as she relishes hamming it up as Hela with her magnificent headdress (the costume designers nailed her look from the comics). In fact, as soon as the film was over I was openly musing about an R-rated prequel with Oden and Hela (Marvel would never do this because of its Disney ownership, thus leaving the Blade series as the only R-rated Marvel film property, but I can hope). Hela is actually fantastic and gives this Marvel movie its best antagonist since Loki (Todd Hiddleston). Not only that, but her character is sympathetic. Not to spoil anything, but Hela has legitimate gripes, and the way she was treated by Odin was pretty terrible. Sure, she’s a bloodthirsty warlord, but she’s right. Ragnarok is great but it's far from perfect. Of all the characters in the Thor series, the all-powerful, wise Allfather Odin, played by SIR Anthony Hopkins, really gets the short end of the stick. He is only in the film for maybe 10 minutes and his character arc is sloppy and rushed. All in all, Odin is a terrible father and it's never completely explained why. Most of the characters just wisecrack their way through the story and don’t grow or change in any way, but that’s fine in an adventure movie with mostly pre-established superheroes. In addition, any moment of serious dramatic tension is undercut by the film’s constant jokes. One incredibly gorgeous flashback that reveals an important character’s motivation is maybe thirty seconds long. The emotional impact of several would-be devastating scenes is thus negated by the film’s main selling point, its humor. Thor: Ragnarok has made over $800 million dollars so far. So odds are you’ve already seen it and my opinion will not sway you either way. However, the film is good. It’s a delightful blend of humor and action. Detractors may say it's Thor: Guardians of the Galaxy, and to that, I say, only in its focus on humor. But it's a completely different type of humor and, unlike Guardians, the movie is not beholden to its soundtrack. Taika Waititi has imposed his distinct brand of Kiwi comedy upon the film, and the Thor series is all the better for it. The lack of significant character development and various moments of drama undermined by the movie’s relentless irreverence are small quibbles. Thor: Ragnarok is big-budget superhero movie done right. TLDR: Thor: Ragnarok is a fun, funny, Marvel romp that focuses on its humor and action at the expense of meaningful character development. However, it succeeds so well you won’t mind. 4/5 Stars.